It is arguing that Great Britain is the 'worst' in the developed world, and I'm sceptical of a few assertions made here. UK pensions don't seem to be based on earnings - Where has this 29% figure come from? Does the Netherlands really increase their citizen's earnings when they retire? Aren't there a few developed nations missing from this chart? Is that cherry-picking to avoid worse results? I had an inkling that Portugal had been through some difficult times recently and I found the 2010-14 Portugese Financial Crisis. Are they still paying such a generous pension, regardless? The numbers in the claim are correct for total state-mandated pension, but wrong for state pension only. 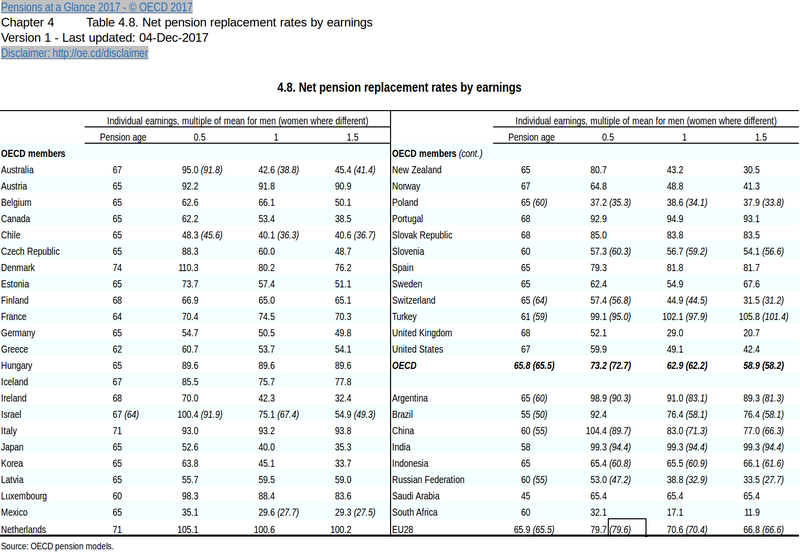 The numbers are confirmed by OECD sources for total pension earnings from mandatory pensions for average earners, compared to earnings immediately before retirement. The fact that the UK ranks worst is a consequence of the fact that participation in workplace pension schemes is voluntary in the UK and has historically required active opt-in, whereas it has been completely mandatory in countries like Netherlands, Italy, Denmark, and France: employers must offer a pension scheme (which is usually private), and employees must be enrolled in those. I think it would be wrong to consider such private pension schemes as a state pension. 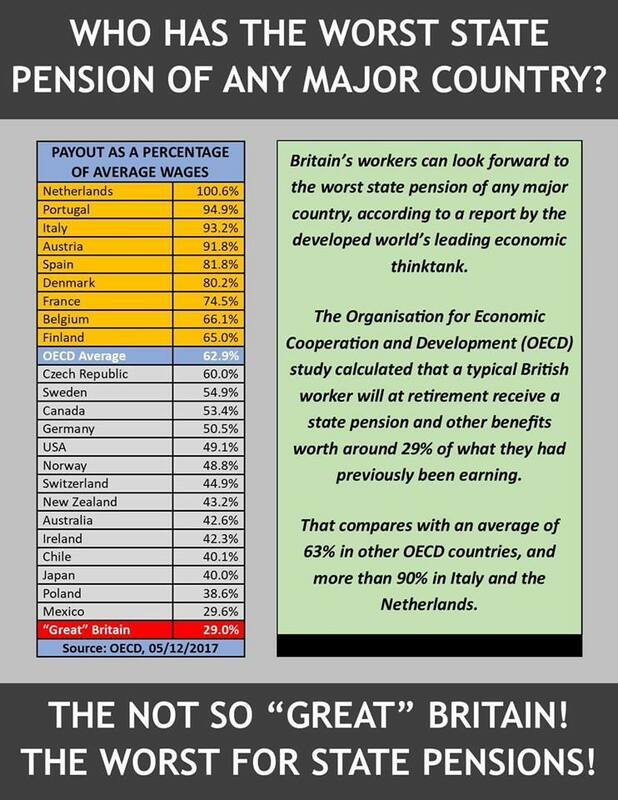 Whether the UK does or doesn't have the worst state pension does not follow from the OECD evidence presented. The claimant, along with The Telegraph, The Guardian, and the Financial Times refer to the presented numbers as referring to state pension, but they actually refer to all mandatory parts of the pension system. In the UK, state pension and state-mandated pension is the same, because the UK does not mandate participation in workplace pension schemes, although since 2012, enrolment has been automatic. In many countries, the state does mandate such participation. In those countries, for most people, state pension is not the same as state-mandated pension. Therefore, strictly speaking, the claim is incorrect, because state-mandated non-state pension schemes are included in the numbers. By this interpretation, The Telegraph, The Guardian, and the Financial Times are all wrong. Screenshot of pension earnings numbers. Source: OECD. Average earners in The Netherlands indeed have an overall (state + other state-mandated schemes) pension that is, on average, higher than their previous net earnings. This is also true for low earners in Denmark, Israel, and China, as well as men in Turkey. The figure for average earners is 100.6% in The Netherlands and 29.0% in the United Kingdom. The next lowest figure is Mexico at 29.6%, but the Mexico figure only applies to men; women in Mexico have it worse at 27.7%, so whether the race-to-the-bottom is won by the UK or Mexico is unclear. Men in Turkey get 102.1% of previous net earnings (but women only 97.9%), so although the list does omit some countries, those omissions do not make the UK pensions look worse than they really are. 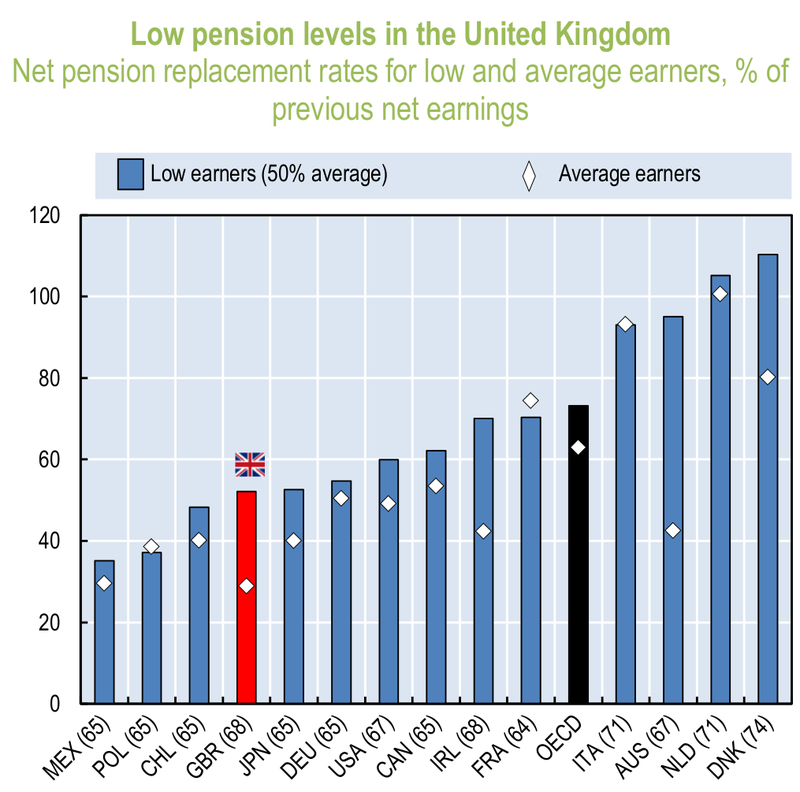 The report also has figure for some non-OECD countries, but none beat the UK (or Mexico) in the race-to-the-bottom, so there is no cherry-picking going on; just a (possibly accidental) misunderstanding on exactly what the numbers mean or a shortcut to use state pensions when they mean state-mandated pensions. To properly answer the strict question on state pensions, we would need to know what proportion of state-mandated pensions are state pensions, and what proportion are other required pension schemes (such as private, in-work pension schemes). For the UK, the two are identical. For most other countries, they are not. I don't know if this question is answerable or even meaningful, considering the considerably differences in how pensions work between countries: if the state pension depends on money paid in, it becomes very much like a in-work pension, and the distinction with a mandatory private in-work pension scheme is arguably not very meaningful. It would be more interesting to compare real overall pensions, rather than only the total state-mandated pension. I don't know what fraction of British employees opt-in to in-work pension schemes, but the OECD numbers are rather referring to a minimum for someone who doesn't opt in to anything optional, than an average reflecting the real situation (unless the aforementioned fraction is very very small). Finally, one should remember that old-age financial well-being is not affected by pension income alone, but by many other factors, such as home ownership, rental income, other investments, debts, cost of living, rental subsidies (in absence of home ownership), funding for health and social care, as well as many other forms of direct or indirect support that government (or even charities) may provide. Not the answer you're looking for? Browse other questions tagged economics united-kingdom welfare . Does the Bilderberg Group have influence on world events? Does the UK send the EU £350 million a week?